Can virtual reality bring back the arcade? Right now the technology is a novelty, but that may change. Virtual reality has wide-reaching implications, but its biggest foothold so far is in gaming. Very quickly, I got tired of the giant creatures manifesting around me to electronic music. I was in the midst of a “beginner” experience at Augment VR Arcade, a new virtual reality arcade embedded in Flash, a nightclub in Washington. While more interactive than a 3-D screensaver, it felt a bit limiting for a medium hailed as the new big technological breakthrough. The headset wires meant I had to be careful to not walk around too much: They literally jerked me back into reality when I got too far. But the bigger problem was that it was, well, a little boring. I wanted the classic video game experience of shooting down alien ships or racing through the streets, even if I wasn’t particularly deft at it. So I selected an interactive rec room where I played a pirate battle game with other players around the world. Despite instructions, I couldn’t manage to find a weapon, let alone combat the onslaught of enemies. I died at least three times before my teammates refused to high-five me back to life in the game, forcing me to confront my own hubris. Virtual reality arcades—a growing trend that, naturally, got its start in Asia—are an awful lot like the classic video game arcades of yore. Instead of quarters, consumers can use their credit cards to purchase access to a variety of games by the minute or time slot. Instead of going from machine to machine, you go from headset to headset to have a range of immersive virtual experiences, including games that let you shoot your way out of a zombie apocalypse (there are a lot of shooter games) or rock climb. Some even come with upgrades, like a driving experience with haptic motion or theater-quality sets with props and effects. More than an attempt to profit off nostalgia, the arcades act as an increasingly important entryway into a long-misunderstood medium. Though investments in augmented reality and virtual reality are projected to reach about $14 billion by the end of the year, VR has had a rocky start when it comes to finding its footing in a wider consumer market. The technology has wide-reaching implications—ranging from medical treatment to new ways of consuming news—but its biggest foothold so far is in the gaming world. Yet even in gaming, at-home VR is out of reach for most consumers. The kind of HTC Vive headset used in most arcades can run for nearly $600, which doesn’t even include a laptop powerful enough to run the content. Even the now “affordable” Oculus Rift headset is still almost $400 after a recent price drop. “The problem is it’s so expensive. The arcade is an access point,” says Wesley Taylor, who leads operations and experience at Augment VR Arcade. The VR/AR Association, a group that represents more than 3,800 organizations worldwide, counts about 60 “VRcades” (a word I fervently hope won’t catch on) in the U.S. and at least 400 globally. Kris Kolo, the group’s global executive director, says most arcades are smaller independent organizations often run by hobbyists. Often located in areas with young people, such as major cities and college towns, virtual reality arcades have a business model similar to that of the classic arcade: Rent out cost-prohibitive technologies to curious consumers in a social space, get them coming back, watch the industry profit. For instance, at Augment, where I encountered dancing monsters and the pirate battle game, consumers can pay $20 for a night of play and the chance to try out more than 30 different experiences, including laser shooting, street-fighting experiences, and some more passive scenarios for newbies like me. The space is equipped with four HTC Vive headsets attached to the ceiling with wires. Using a set of wireless controllers, users can point at a mounted monitor to both select games and move around. While it might seem more complicated than mashing buttons and swiveling joysticks, the space evokes the kind of high-tech wonder that early gamers experienced at arcades. Historically, “you got the best graphics, the best gaming experience in an arcade,” says Augment founder Mike Frye, who has been involved with gaming since he had to physically carry a desktop computer around for LAN parties. Locating the arcade inside the nightclub (Flash’s owner is a co-owner of the arcade) allowed him to avoid a large overhead for rental space, something he says he’s seen drive a lot of other arcades out of business. 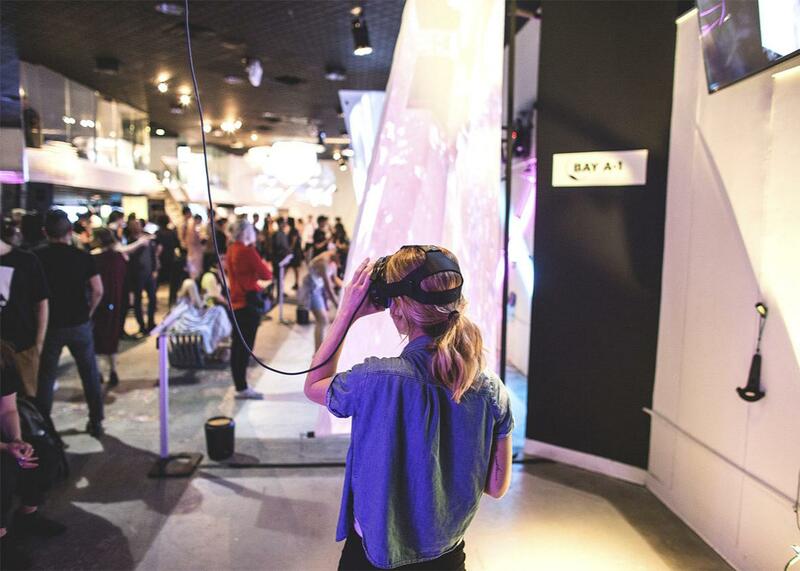 If Augment Arcade is on the indie side of the spectrum, VR World—which at three floors touts itself as “the largest virtual reality center on this side of the planet”—is the height of a curated VR experience. Located in New York City near the Empire State Building, the space offers users over 50 different experiences ranging from documentaries to the popular Fruit Ninja game, a MOVEO 360-degree rotation simulator, and partnerships with different artists and musicians. “It’s about showing the prowess of this technology as a storytelling medium, as something that has great ability to make the viewer become more of a protagonist in the story that is being told—give them more agency,” says Jessica Gray, VR World’s marketing director. She says the customer base has a “healthy split” gender-wise, and they’ve seen all ages trying out the technology. When I visited the location one recent late Friday afternoon, the crowd ranged from schoolchildren to adults in their 30s. Most customers had come in groups, many clearly first-time visitors. Each station had guides to help visitors get the best user experiences and walk them through the tech. This isn’t the first time enthusiasts have proclaimed arcades as key to bringing VR into the mainstream. The technology made a brief cameo in arcades during the short-lived VR boom of the ’90s. In 1991, the now-dissolved manufacturing arm of the Virtuality Group introduced a set of games, including the then-revolutionary Dactyl Nightmare, in arcades across the country. But as both the demand for arcades declined and enthusiasm for VR fizzled out, the company was sold and the games went defunct. Early VR gaming was both technologically brutish compared to the systems today and unable to find a gateway to the kind of consumer appeal that fueled video gaming. As quickly as they had hailed the medium as the next big thing, big-name investors like IBM dipped out. While VR tech might be better than ever before, arcades now have to contend with a bigger challenge: a changing American way of life. The classic arcades, now a relic for museums and kitschy bars, came of age during a time of malls (mostly dead now), pre-internet socialization (massive multiplayer online games now allow you to play with users from around the world without putting on pants), and rising incomes (you get the picture). Their virtual reality predecessors are trying to break in at a time when users are inundated with entertainment options, many at the touch of a phone screen. Perhaps that’s why most seem to hedge their bets—offering other amenities like full-service bars and cultural experiences that can appeal to the nongamer crowd. Of course, in bringing video games to the mainstream, the traditional arcade fed its own demise. Kolo isn’t so worried about that, though: “We still go to places to play pool because we want to play with other people.” Big entertainment companies like Imax, which is working on a line of VR arcades, and Disney (which incorporated VR into its recently shuttered DisneyQuest arcade) are risking history repeating itself. “We have a space you really can’t re-create at home,” says Gray. For instance, most casual home users probably aren’t inclined to invest the necessary money or space in the sensor tracking needed for a fully immersive VR experience. The more immediate risk of VR is that you will look, well, ridiculous. While Gray was giving me a tour of the different experiences, I couldn’t help but notice a young man laughing at his friend as she tried to wobble down a straight line, her face gripped with fear and concentration. It was a strange sight, seeing the screen projecting the tightrope-walking game she was experiencing in immersion in a cartoonish 2-D projection. We were in the same space having radically different experiences. But once the headsets were on, at least we all looked ridiculous together.